Borrowed this image from Black Looks' blog (she in turn borrowed it from the Pilgrimmage to Self blog.) 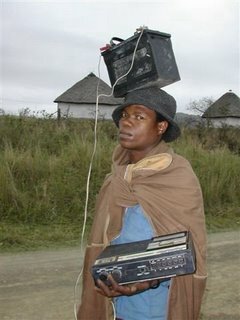 The serious question it raises is this: Ipods cannot become fashionable accessories on this continent unless there is an IT infrastructure in place (no infrastructure = no cheap speedy internet access for all). One of the huge problems in Africa is that most leaders are old men who have no clue about the significance of IT, or even if they appear to, it is empty rhetoric. If there ever was a good use for post-colonial guilt money, it would be in helping to build a trans-continental fibre backbone. That way, this poor chap could have a slim white object in his pocket instead..